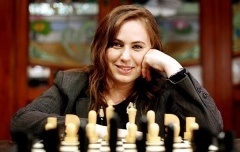 Unquestionably the greatest female chess player of all time, Judit Polgar has single-handedly disproved the notion that women are incapable of competing with men in chess. Her fierce attacking style is capable of striking fear into the heart of any opponent, and her victims have included World Champions Garry Kasparov, Anatoly Karpov, Boris Spassky, Vasily Smyslov, Veselin Topalov, Viswanathan Anand, Alexander Khalifman, Ruslan Ponomariov and Rustam Kasimdzhanov. Her rating peaked at 2735 and world no. 8 in 2005, while she continues to lead her female rivals by a large margin. It all started as an experiment by her father, Laszlo Polgar, who intended to prove that geniuses are made rather than born. Judit and her two older sisters were home-schooled and all developed into formidable players, but the youngest proved the hungriest for success. By the age of 12 she’d beaten a grandmaster and was already rated higher than the reigning women’s World Champion Maia Chiburdanidze. She went on to beat Bobby Fischer’s record as the youngest ever grandmaster when she claimed that title in 1992 at the age of 15 years and 5 months, while she first broke into the world Top 10 as a 19-year-old. Early successes included joint first with Evgeny Bareev on 9/14 at Hastings 1992/3 and 7/9 in Madrid 1994, which put her 1.5 points clear of her nearest challenger in a field that included Gata Kamsky and Alexei Shirov. Much more was to follow. Judit’s chess career was brought to a temporary halt in 2004 and again 2006 when she took time away from the game after giving birth to a son and daughter. Although she sometimes struggled to recover her previous form, in 2011 she gave glimpses of the old fire. Judit finished joint first with 8.5/11 at the European Individual Championship (pushed down to third on tiebreakers), and then had a fine run at the World Cup, defeating the ratings favourite Sergey Karjakin on her way to losing a quarterfinal to the eventual winner, Peter Svidler. I wonder if you as a GM (and all others GMs) just have a great talent at playing chess and you SEE the game or did you also have to learn and had to be taught playing chess (strategies, openings, etc.). I keep playing (no lessons whatsoever) and therefor no progress at all. I feel like I'm really bad at chess. GREAT ‌REALLY! ‌She is now 40 (not so old, if you ask me) but I can't see her active.